Another couple of recipes for you all to enjoy. Since the Scottish Short Bread went down so well we’ve stuck with the Scottish theme to start with a classic Haggis! I’m going to be honest and say we’re not too keen to try this one. Liver is not something we generally buy so we think instead we might adapt it a little and as for the ‘haggis bag’, if any of you wish to use the traditional sheep’s stomach you again may well be on your own. For our second recipe we’ve chosen something a bit more fun to recover from the haggis experience. For those who aren’t familiar a barm is the yeasty foam that rises to the surface of fermenting liquors and is basically an archaic word for yeast. Again we may have to adapt, simply based on the quantities. I don’t about you but a barrel of Orange Wine seems a little excessive, even for us and there is no one willing to pare two hundred and forty oranges! Still if you’re planning a party maybe you’ll be willing to try for the whole barrel. In which case we have to insist on seeing proof of the final result. Culloden is such a key part of Scottish, British and indeed world history that you find reference to it cropping up in lots of places. For example, the laird of Brodie Castle had government troops camps on his land before the battle and Fort George at Ardersier was built after the battle to house all the government troops stationed in the Highlands to police the Jacobites. For this post though we are looking at the story of Hugh Miller’s grandfather that can be found at Hugh Millers Birthplace Museum in Cromarty. Hugh Miller’s grandfather witnessed the Battle of Culloden from the Hill of Cromarty when he was a boy of fourteen. His grandfather told of the day being drizzly and thick, and when he climbed the hill he found many townsfolk already assembled. A little after midday a round white cloud rose from Culloden Moor, and then a second beside it. He recalled hearing the rattle of smaller fire-arms mingled with the roar of artillery. Then after what felt like an exceedingly short space of time the clouds dissipated, and the rattle and roar was replaced with the sharp patter of musketry. In his recount of these events Miller also talks of another story told to him by a woman who on the day of the battle was tending sheep. She sat listening to the boom of the cannon in terror but was still more scared by the howling of her dog, who sat upright on his haunches the whole time the firing continued, reportedly “looking as if he saw a spirit”. During his life Miller also spoke with at least two soldiers who fought at Culloden, one on the government side, the other the Jacobite. The first, a forester, accompanied the Government Army to Fort Augustus and spoke of the atrocities he saw, some of which still made his blood boil seventy years later. He talked of scores of cottages in flames, and droves of cattle brought in from Highlanders’ lands. At one point he mentions there must have been about twenty thousand cattle, and groups of drovers from Yorkshire and the south of Scotland used to come in every day to share in the spoil and buy the cattle at greatly reduced prices. This unique personal account is an amazing recollection that helps bring the story of Culloden to life and we love to hear these special insights that help connect us to the feelings of the people at the time of the battle and share so much more of the story than just facts and figures. As always like, tweet, follow, share and tell stories of your own because one day they may become fascinating glimpses into history for later generations to enjoy. All the best K & D.
Most people may not stop to think about but the origins of this phrase, but it should be clear by now that we’re not exactly most people. And impressively enough the phrase ‘laughing your head off’ actually stems all the way from Jacobite times. When you stop to think about it you may be able to guess the circumstances but we’re here to tell you the whole story. It was this week in 1747, the 9th of April to be exact, that Simon Fraser, Lord Lovat was executed on Tower Hill in London by John Thrift. Lovat was Chief of Clan Fraser of Lovat and by all accounts he was not a particularly nice man, with a violent streak and a cunning mind. During the ’45 Uprising he forced his son to fight with the Jacobites while he himself professed his loyalty to King George II claiming his sons actions were against his wishes. Following the Jacobites defeat at Culloden his deceit was soon found out by the government and he was forced into hiding in the Highlands. He was eventually arrested on an island in Loch Morar and transported to London where after a trial lasting five days (in which evidence was given against him by fellow Jacobite John Murray of Broughton) he was sentenced to beheading on 19th March 1747. Shortly before the execution, a scaffold for spectators viewing the beheading had collapsed and left 20 dead, much to his amusement. Apparently Lovat was laughing about the spectacle as the executioners axe fell. So ended the life of Simon Fraser and the phrase ‘laughing your head off’ was born. 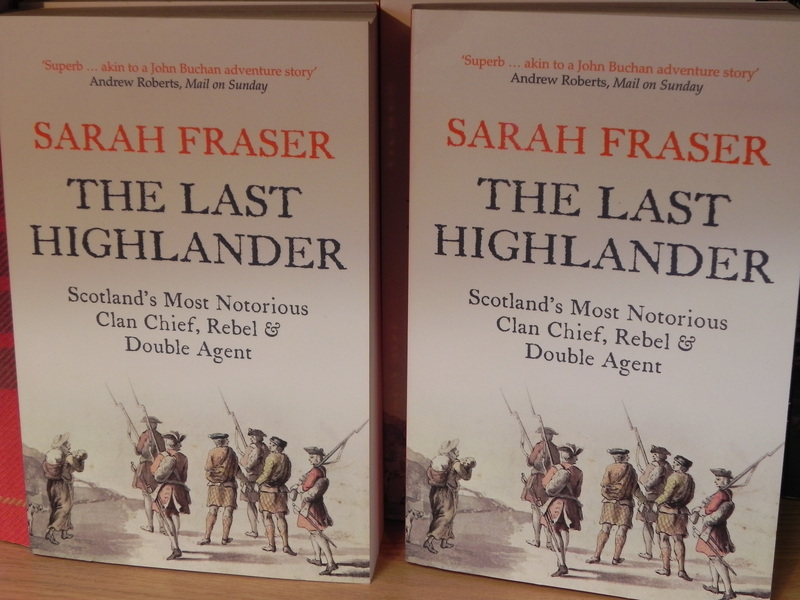 For those interested in the life of Simon Fraser there is a book ‘The Last Highlander’ available, of course, from our shop at Culloden Battlefield that covers all his infamous adventures and misdeads. Interestingly this is not the only phrase to originate from Jacobite times, how about ‘flash in the pan’? Meaning a short lived success, in the 1700s, the pan of a flintlock musket was a part that held the gunpowder. If all went well, sparks from the flint would ignite the charge, which would then propel the bullet out of the barrel. However, sometimes the gun powder would burn without igniting a main charge. The flash would burn brightly but only briefly, with no lasting effect hence a ‘flash in the pan’. I’ve been wondering for a few days now just how old is too old? People will tell you, should you feel compelled like I did to ask, that “age is only a number”, and “you’re only as old as you feel”; but surely there comes an age in life when it is no longer the social norm to be taking part in an Easter Egg Hunt, unless, of course, you have some little ones to justify your participation? 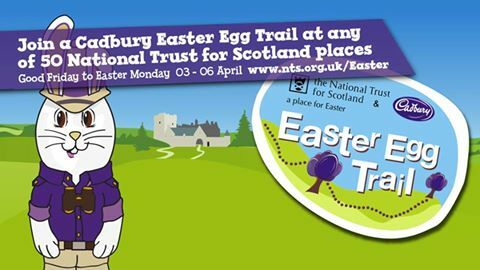 The reason I have been pondering such a monumental question is that, with the Easter Weekend now upon us, the NTS will be running their annual Cadbury Easter Egg Trail across 50 properties, so naturally I wondered whether it would seem unusual if a slightly–older–than–normal participant turned up. According to C.S.Lewis “some day you will be old enough to start reading fairy tales again”, maybe the same can be true of hunting for hidden Easter eggs? Inhabitants of Scotland in the 1700s would have been mercifully free from such a dilemma. In his book ‘The Social Life of Scotland in the Eighteenth Century’, Henry Grey Graham states that “the old Presbyterians despised keeping ‘Yule’ as a miserable superstition, approved highly of schoolmistresses who gave parties to the pupils on Good Friday”. I’m almost certain the pupils would have approved too, quite far removed from our custom of searching – at times frantically – for hidden chocolate eggs! But, with only days left to go, the lure of chocolate is becoming slightly unbearable ….maybe the Duck Race at Barry Mill would provide an Easter Weekend void of temptation!